what’s not to love? Stylish, durable, industrial and unique, so I think. My first exploration into this amazing medium was with a guy who used to make flagstones. 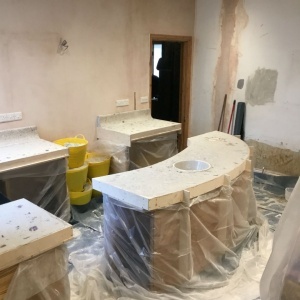 I thought it would be fun and easy to cast a worktop elsewhere. 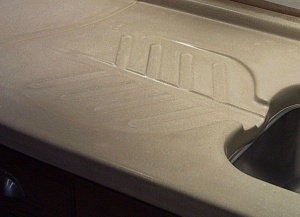 Oh and just throw in a grooved sink drainer. We had a lot to learn about a lot of processes! 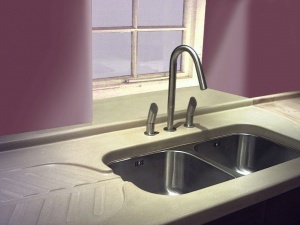 We started with rubber moulds so that we could incorporate 3D features such as splashbacks and drainers. 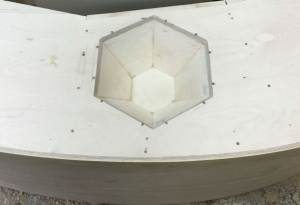 The combination of building a plug to make the mould, getting the release agents to work and dealing with the huge wooden casting boxes made it all a bit of a faff. We also needed a large vibrating table. It would be a great idea if I was going to recast the same shape over and over. Sadly the variety of shapes and sizes in different kitchens meant that I needed to make almost every piece every time anyway. Polishing was easier and less messy to do in the workshop than onsite but harder to get flat especially when lining pieces up together. So to in situ casting, the discovery of a hand held vibrating trowel inspired me to give it a try. I was reluctant at first to give up the cast features but found it easier than I had anticipated. I was also able to add an underslung lip to the front of the worktop which gave the look of a thicker worktop without the weight. The polishing was easier once I had surrounded myself with a Dexteresque “kill room” of sheeted plastic. 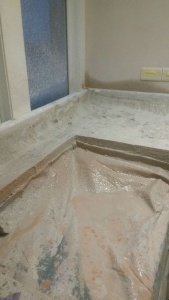 These days I am combining the best of both techniques to create an in situ cast to achieve a seamless worktop whilst still having the 3D dimensions from a mould. 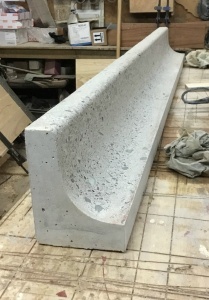 To do this I have precast substantial curved splashbacks, some say sea defences. 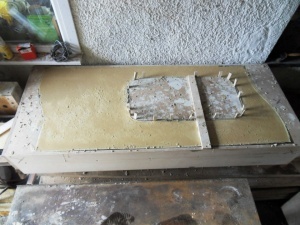 I have then poured up to these in situ and also cast a seamless sink using a plastic bowl as a mould. Hopefully my continuing development of these skills will culminate in a poured sink with shaped integral drainer.